I’m kind of rooting for Atlas on this one. 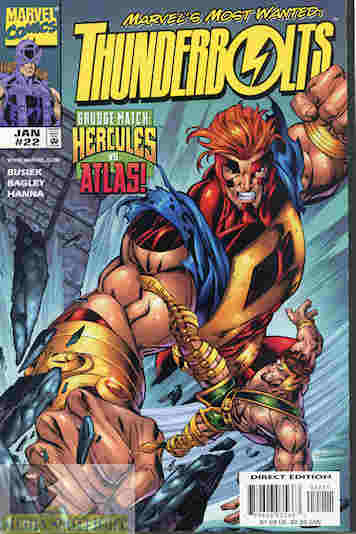 What they got right: The fight is quite fun to watch (and yes, I’m still rooting for Atlas and the Thunderbolts given the last time I saw Hercules…the man needs to learn a little humility…not brain damage mind you but I’m talking about things he did AFTER those events–plus he called Jolt a “wench”, so he deserves a smack). Abe and Melissa have a great moment as he tries to convince her he’s doing the right thing. I’m so glad to see these two back on track and when he returns I want more of this! What they got wrong: I know the point of him being here is to give Hawkeye a chance to prove to the Thunderbolts he means what he says about murder and heroes, but it just kind of feel like it came out of nowhere. I guess under the circumstances Erik is right and this encounter was inevitable if fans called Buisek or any writer after him out on that previous story but it is oddly timed. Recommendation: I still fully support this run. Give it a read! Posted by ShadowWing Tronix on July 24, 2018 in Marvel Spotlight, Yesterday's Comics and tagged Atlas, Erik Josten, Goliath, Hercules, Mach-1, Marvel Comics, Marvel Universe, Thunderbolts.